This is a fabulous villa. Standouts include the stunning sea views, gorgeous beach, expansive outside space and heartwarming team of staff, not to mention the great food. 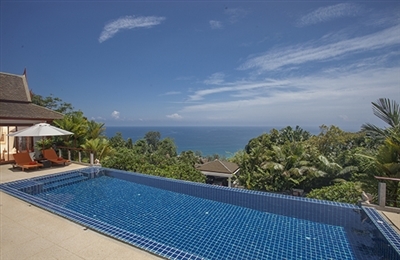 Everything about the villa is very family friendly and group orientated - the sky blue swimming pool with its shallow ledge; the huge garden with plenty of space for the kids to indulge in cricket or football; the interconnecting rooms; and the lovely beach with calm sea ideal for paddling. We thought the staff were excellent; friendly, experienced and capable. The chef was particularly enthusiastic and his cooking was fabulous. He’ll even make snacks for kids such as jammy dodgers, an all-time favourite. He will also stock the kitchen with basic provisions prior to your arrival, and prepare your first two meals so that you can arrive relaxed and at ease. There’s a Nespresso coffee machine in the villa, but as you can’t buy the capsules in Sri Lanka, you’ll need to bring some with you. If we needed anything else, the staff shopped for us and they were able to arrange transport for us to visit attractions, restaurants and the fort at Galle. Visiting in March 2013, three years after our original review, we were pleased to discover that the villa has the same lovely staff team and is as immaculately presented as before. Each master bedroom has its own mini fridge and the villa is also now equipped with a generator. There are a lot of great things to say about this villa. First, thank you wholeheartedly to the staff for the warm welcome and for graciously putting up with all our requests. They made everything about this trip special for us and we’ll never forget it. The owners obviously put a lot of careful thought and attention into the villa as well. There are all kinds of interesting artefacts on display and plenty of travel guides and books on Asian interior design to digest. The bedrooms were larger than expected, and the TV and DVD player were a big plus. But the winning feature of Avalon has to be its location. 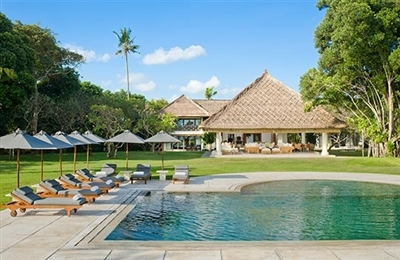 It was a treat to find such a large – and affordable – villa so close to the beach in Canggu. Being able to pop out to the beach without having to pack a day’s worth of stuff for the whole family was the most freeing holiday experience we’ve had in years. We could essentially wake up and go straight down to the beach, and then bob back and forth between the beach and the villa as we pleased. It’s that close. Staying on a dead-end road was also really special because it meant the beachfront was much quieter than other beaches where cars and motorbikes could go. Walking through the La Laguna restaurant and crossing its wooden bridge to get to the ocean was a welcome detour (rather than sneaking by on the footpath beside it) and we spent plenty of time as patrons there, too. You could easily watch the sunset there daily. As big fans, we didn’t mind hearing their weekend DJ sets from the outside areas of our villa. I would stay at Avalon again in a heartbeat. Hats off to the team at Avalon for delivering an amazing holiday experience for our family. Thank you! We were made to feel like VIPs with the most courteous care and would have gladly stayed forever in this fairytale setting by the sea. We came for a beach experience, but this villa stole our hearts. 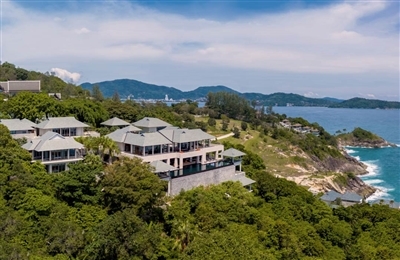 Its proximity to the beachfront was what led us to Avalon II, and the location is something special; but the charm of the villa is indescribable. 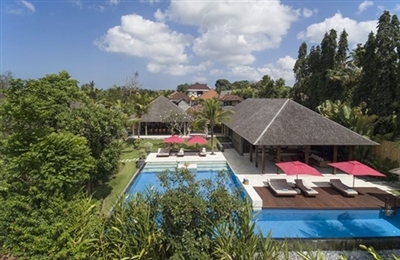 We’ve rented other vacation homes in Bali, but never opted for a villa with living areas quite so open to the elements. I’m not the woodsy camping type. Well, Avalon II’s open-sided living room is gorgeous in every way and suits a Bali holiday just fine. One relatively small square space combines the modern with the traditional and the fab with the practical. I was blown away by things like quick-drying patio furniture below a hand-carved wood ceiling and the grand woven basket which is lovely art and holds umbrellas at the ready in case of tropical showers. The joglo accommodated our needs throughout all phases of each day, the same poolside patio and games room where the kids could drip with pool water also passing as a dining room in the evening complete with antique chandelier. Initially hesitant about Avalon II’s the size and layout, now I think every two-bedroom villa should be just like this, with an outdoor living room by the swimming pool. Again, it must be said that also behind the magic ambience and versatility of the villa are the staff who mop up, keep things sparkling and deliver meals like clockwork, which they do so discreetly and effortlessly. 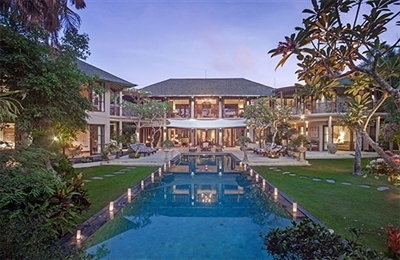 We’re bragging about this trip to everyone we know in hopes they’ll join us for a short break before too long, and perhaps we can all stay in the main villa together for a group holiday. With or without them, we’ll be back. Don’t change anything! Staying at Avalon III exceeded all my expectations. It is a small villa but has everything two people could ask for. 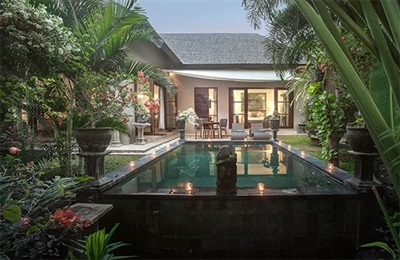 The exclusivity, privacy and location of this place make it my favourite one-bedroom villa in Canggu, and I would choose it again and again over any Bali five-star hotel with a front desk and fancy spa. 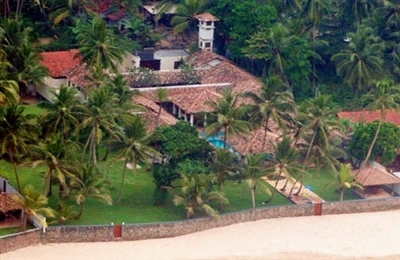 I recommend this villa to anyone, especially if you love the beach. Who would have thought you could have your own little tropical beach house with a private pool for the price of a luxury hotel room? We appreciated having air-conditioning in every room, and with glass doors looking onto the pool deck from the living room and bedroom, it still has a tropical jungle vibe, whether you are indoors or out by the pool. 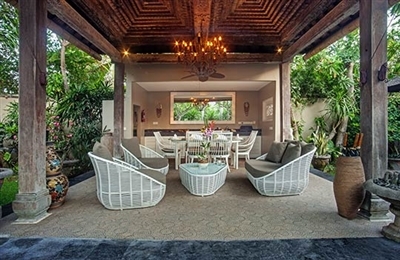 Outside, there isn’t much of a yard, but there’s a table big enough for two to dine alfresco, and a set of wicker lounge chairs by the pool for sunning in total privacy. At night, the pool lights up and you can gaze at the stars, so very easy to turn up the romance. You can make your own meals, order groceries or room service, or get delivery from outside. The villa staff were flexible and responsive to our requests. We asked for maximum privacy, so they’d wait until we left to tidy everything brilliantly, and then they were always available outside the villa when we came back in the evening if we wanted anything.